"What's that sound?" my two year old son would ask on Thursday mornings while eating breakfast. "I don't know," I would say with a pretend super-surprised face. "Let's go see." He would jump down from his chair and I'd quickly open the front door. With both arms outstretched and one finger on each hand pointing out in front of him, he would shout, "Trashy Town! Yeeeeah!" Garbage day was very exciting at our house for a very long time. Even to this day garbage trucks are known as "Trashy Towns." Andrea Zimmerman and her husband David Clemesha wrote the book Trashy Town in which our hero Mr. Gilly "Dumps it in, smashes it down, and drives around the Trashy Town" cleaning up all the garbage. Our family first encountered this book on a Scholastic Storybook Treasures DVD . It was recognized as a Notable Book and Notable Audio/Video by the ALA. We have enjoyed watching this video and reading this book countless times. 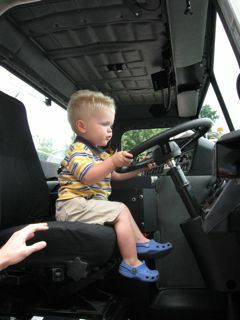 If you know a young boy who loves trucks, Andrea Zimmerman has also published the books Dig, Digger Man , and Fire Engine Man. Our favorite is Dig which is very similar to Trashy Town. In this book, Mr. Rally sings like Mr. Gilly, "Dig up rock and dig up clay! Dig up dirt and dig all day!" 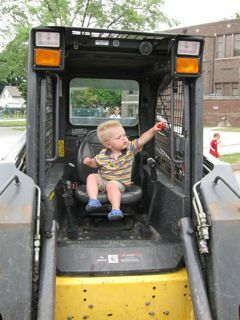 while he completes five jobs with his backhoe. When I think about my own childhood birthdays, one of the first memories that comes to mind was at my party when I was probably eight years old. As I opened the presents from my playmates, I saw that two girls had given me Barbie type dolls and they were identical, except for the hair color. One was blonde and one was brunette. I appreciated both gifts, but I secretly preferred the blonde. And I felt guilty about it! I felt ashamed to like one doll better than the other. I certainly didn't let the girls who had given the gifts to know, and in a fantastic, imaginative way, I didn't even want the dolls to know that I preferred one. It's good for a children's book writer to remember how strong and complex the emotions of childhood are! A strong memory of my son's birthday was actually what came around after each birthday was over. He was our first child and we were determined to make sure he had a healthy diet, therefore, he got very little sweets. But the arrival of another birthday meant that he was once again eligible to choose one day to be "My Day." On that special day, some time before his next birthday, he could have anything he wanted to eat--no holds barred. In the morning of the chosen day, we'd go to the store and he could get unlimited junk food and treats, and have as much as he wanted, all day. He still talks about how wonderful it was to have "My Day." Thank you, Andrea, for sharing your birthday memory and tradition. We hope you have a wonderful birthday... hopefully full of unlimited junk food and treats! I know I've said this before, but your kiddos are just the cutest things ever! I love the video with you guys going around to all the different places with Mr. Gilly. So fun! I've already added Trashy Town to the "Christmas books list" which means we'll be enjoying it very soon. Thank you so much for the recommendation and the wonderful post! Celebrations! What a great idea - so glad I discovered your blog.